Some 200 outdoor pedestrian malls have been built in the U.S. since the late 1960s, yet only 30 or so remain in operation. One that not only has navigated the economic ups and downs of the past 27 years, but is considered the premier shopping and dining destination throughout Vermont, is Church Street Marketplace in Burlington. The product of an inclusive and careful planning and design process, Church Street Marketplace is one of APA's 2008 Great Public Spaces in America not only for the historic buildings, thriving retail trade, and carefully maintained streets and walkways, but also strong community support. Each year some 3 million visitors come here to shop, eat, meet and greet, mark milestones, or just pass the time of day. 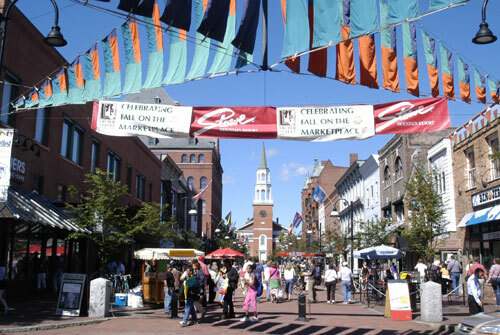 Founded in 1981, Burlington's Church Street Marketplace is a business improvement district and a department of the City of Burlington, Vermont. Photo Courtesy of Ron Redmond. Church Street Marketplace is part of a proposed National Register Historic District, with Victorian and Art Deco structures, and modern infill buildings. Building heights are restricted to preserve the appearance of historic structures while zoning promotes ground-floor retail and upper-story office and residential uses. Fountains, public art, and locally quarried boulders enhance the streetscape. Street vendors and entertainers keep the atmosphere lively. In warm months, outdoor cafes are the perfect spot for people watching or conversing with friends. Festivals add excitement. The Magic Hat Mardi Gras Parade kicks things off in February, followed in June by the city's Discover Jazz Festival. On the day after Thanksgiving, Santa pays a visit from the North Pole; later that evening, more than 10,000 gather to watch the illumination of more than 200,000 white lights along the four-block-long Marketplace. "What I love about the Marketplace," says Tim Halvorson, former chair of the Church Street Marketplace District Commission, "is that it reflects the unpredictability of life itself." Views from the Marketplace are magnificent thanks to the downtown's grid pattern, first recorded in Ammi Burnham Young's 1830 "Plan of the Village of Burlington, Vermont." The most notable is the 1816 First Unitarian Universalist Society church with its clock tower steeple. Spring and fall sunsets align with the cross streets, adding dramatic displays of color and light to impressive views of Lake Champlain and the Adirondack Mountains. The cross streets allow access for delivery vehicles, a component considered vital to a pedestrian mall's success. With 63 specialty stores, 13 national retailers, and 26 eating and drinking establishments, the Marketplace offers something for every shopper. Vacancies are rare given the mall's 97 percent occupancy rate. The Marketplace also hosts 20 food and retail cart vendors and issues permits to more than 200 street performers annually. The highlight of downtown Burlington, this 19th-century and Art Deco walkway frequently hosts public events and festivals. Photo Courtesy of Ron Redmond. The outdoor mall concept for Church Street Marketplace originated in 1958 as part of urban renewal discussions. It wasn't until 1971, when an experimental closure of the four-block area demonstrated the mall's feasibility, that planners, street and traffic engineers, and downtown merchants began their cooperative planning effort. Several plans were scrapped because of complaints from citizens and business owners. Planning efforts continued, taking residents' concerns into account, until an acceptable plan emerged. In 1979, voters approved changes to the city charter to establish the Church Street Marketplace District and the Marketplace Commission. It took two attempts, however, before voters approved a $1.5 million bond issue for the mall in October 1979. With support from U.S. Sen. Patrick Leahy for $5.4 million in federal funds from the former Urban Mass Transportation Administration, local officials moved ahead. Leahy has secured an additional $7.8 million in U.S. Department of Transportation funding over the past decade to upgrade and expand Church Street. During 16 months of construction, which was completed in September 1981, not one business along Church Street moved or closed; retail sales in the area showed no decline. Despite all of the success and good fortune of Church Street and downtown Burlington, stakeholders are beginning to ask: "What will the next 25 years bring?" Retail competition from the suburbs is heating up, responsible growth of the city's commercial tax base is essential to the city's financial viability, and rising fuel prices and other external forces are creating new challenges. The Marketplace is leading an effort — along with the Burlington Business Association, Community & Economic Development Office, and Department of Planning and Zoning — to update the city's downtown plan to help guide future economic vitality. 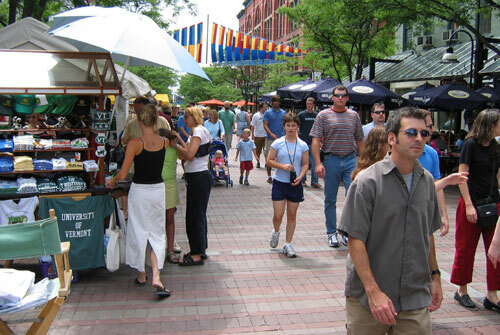 Church Street Marketplace, called "the gem in the crown" of Burlington, demonstrates how good planning and design, a committed citizenry and supportive business owners, and quality management can maintain the vitality and vibrancy of an outdoor pedestrian mall. 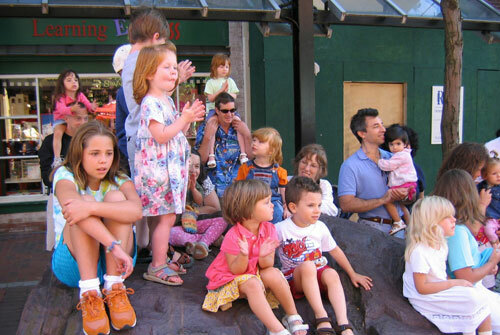 Children watch music performances during Kidfest Music Show 2004. Photo Courtesy of Ron Redmond. Great Streets: Burlington, VT's Church Street from STREETFILMS on Vimeo.